"Gary and Paul decorated a badly water damaged dining room. The finish is now immaculate. The most professional job I've seen. The work was done on time and to the estimate. They were prompt, very tidy and very neat, a pleasure to have in the house. They explained the work and costs fully.It's a mark of the pride in their work, that Gary did not consider the job finished until he had made sure the glass in the windows was sparkling. I highly recommend them." "Very considerate workers and cheerful at all times." "The quality of the work from last time I had the outside painted is why I reused the company. Plus they are totally professional, you know when they planned to do the job etc." "Reliable, good quality work carried out in difficult weather conditions, careful and hard working." "Excellent quality work, professional and knowledgeable people, hard work." "Gary and Paul were unfailingly hard working, skilled, helpful and courteous. Great Job." "Beautiful workmanship and very professional." "Excellent work with meticulous preparation, reliable, tidy, hardworking and pleasant." "Excellent quality work, pleasant and thoughtful in the house. Good attention to preparing the surfaces." "A competent, excellent job by two experts at their work." "Fantastic pair of workers. Very pleased with the end result. Will use them again soon." "Good to do business with, efficient, tidy, reliable and pleasant." "Excellent and thorough work - existing paint removed before new paint applied." "Nice to have someone who can work without the radio!" "Excellent service - arrived punctually at agreed times, clearly took pride in their work and enjoyed giving customer satisfaction. gave me a follow up call the week after completion to check we were satisfied." "Would highly recommend them,. Would certainly use them again." "Cannot be faulted. Put in long days, very courteous. Excellent work and all on time." "Very professional job. Completed on time." "Thoroughly reliable and expert decorators." "Not cheap but excellent quality of work, reliable and professional. Took care at all stages of work. 2 men were here for 10 days." "Reliable and working to a high standard." "Excellent workmanship. Hard working, polite and skilful with great attention to repairs and preparation as well as fine finish." "Undoubtedly the best decorator we have ever used. Highly recommend!" "Excellent workmanship and helpful and pleasant to deal with." "Chalk and Brown, where the best service, best workmen, best decorators ever. Tidy, clean, safe, helpful. Kind lovely men." "Very pleased with works carried out. Chalk and Brown were very professional, reliable, clean and tidy and took pride in their work. Will recommend." "Good advice, clear quote excellent work, neat, tidy, prompt and friendly people." "Excellent workmanship, friendly and helpful to deal with." "The workmanship was of a high standard." "Absolutely first class workmanship. Reliability, punctuality and Trustworthiness. You could not find a better artisan Tradesman"
"Excellent craftsmen. Exceptional high standard in all aspects of work particularly in preparation before painting began. Reliable in all aspects. Quiet and clean workers. Pleasant people." "Very efficient and helpful throughout. Good advice provided when required. Did exactly what they said they would do." "Excellent standard of workmanship and finish. Time spent on preparation and house left very clean and tidy afterwards." "Paul and Gary are a pleasure to deal with and their workmanship and thoroughness is exceptional." "Possibly the best work we have seen in the course of nearly 40 years living in this house." "Fabulous workers would have no hesitation in recommending." "Gary and Paul are fantastic decorators. I would have no hesitation in recommending them." "Excellent workmanship and very efficient. No hesitation in recommending this company to others." "A very professional firm with high standard of workmanship and customer care." "Excellent firm. The quality of workmanship was very high. All work was finished to an excellent standard. Cheerful and careful work finished on time." 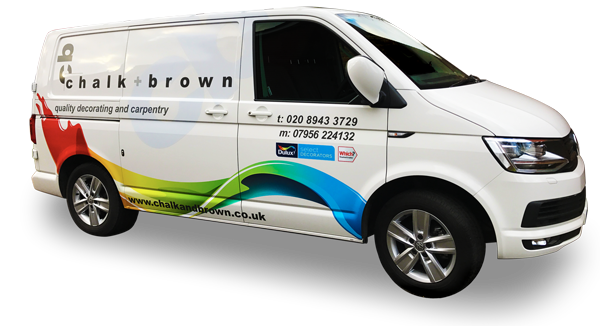 "Totally reliable, excellent workmanship, pleasant and courteous"
"I have used these decorators for several years and they are excellent in every way"
"Service was outstanding in every respect... quality, cleanliness, time keeping and courtesy"